In my 51st year, just after Christmas, I started composing a series of poems to summarise my life. The idea was that each poem would encapsulate a memory from each of my 50 years. Each poem would be 50 words in length (though I would get to decide what counted as a word). I was going to call the series 50/50. The first 10 poems were easy, the next 5 came soon enough, but extracting the subsequent poems from my creative subconscious has been like drawing teeth. There are currently 24 I’m fairly happy with; a few more in note form. I’m wondering whether I can hope to complete the series before I turn 60.
http://thewordinferno.blogspot.com/2010/11/love-project-collaboration.html) The invitation galvanized me into doing something. I found myself looking through photographs I took in Andalucia when Agneta and I were there just after my 50th birthday, and I started thinking about a 50/50 poem that might stand for 2008. Deadlines can be remarkably helpful. Seven days early, here I am with a poem and an accompanying picture. They clung to one another. See the whole picture in one long strip here. A note on the picture: I photographed almost all the original images in early September, 2008. 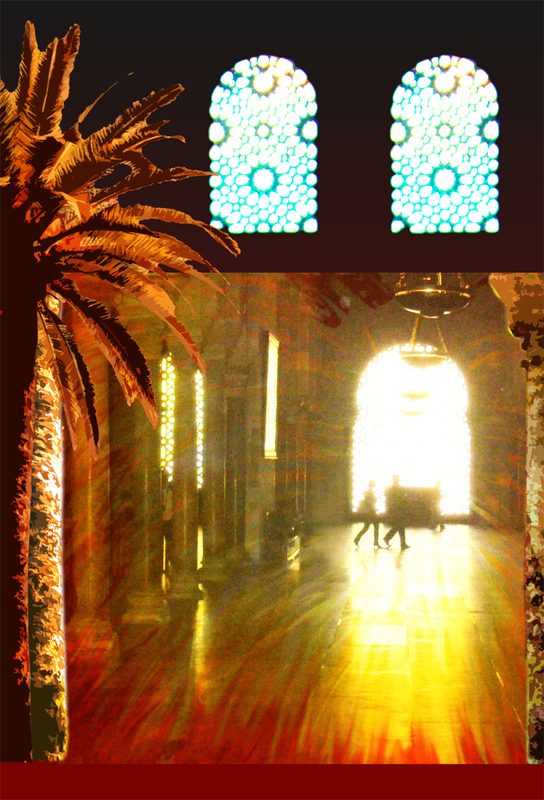 The two main panels as well as the framing columns are based on photos taken in the Cordoba Cathedral-Mosque. 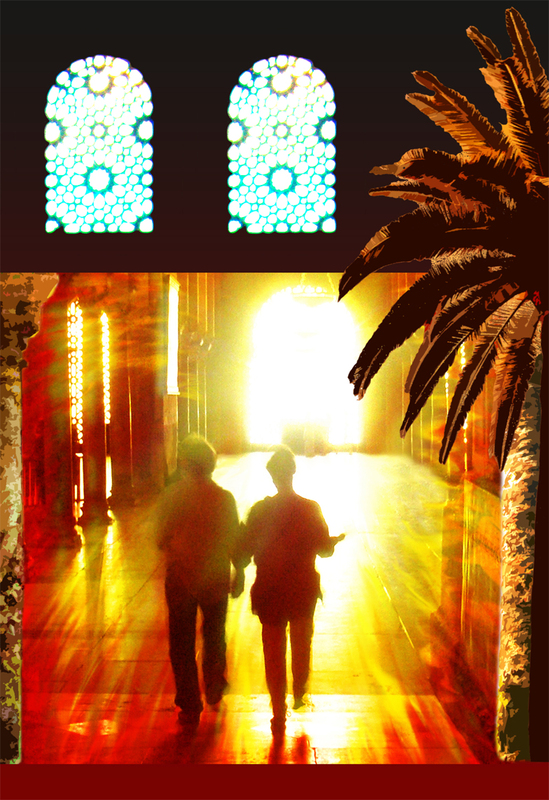 The doorway is one of the doors to the Cathedral-Mosque. The windows at the top ot the picture were photgraphed in the Alhambra Palace in Granada. The palm tree photo was taken in Seville. The loving couple, though, were snapped in Gothenburg about a year later. In my mind as I made the picture were medieval and baroque alterpieces as well as the work of Gilbert and George.